With Mother Nature bringing some crisp fall weather, undergraduate students shared the CNR experience with their families during Family Weekend, held October 12 – 14, 2018. The weekend – an annual tradition – gives students an opportunity to show their school spirit and pride at an array of events on and off campus. 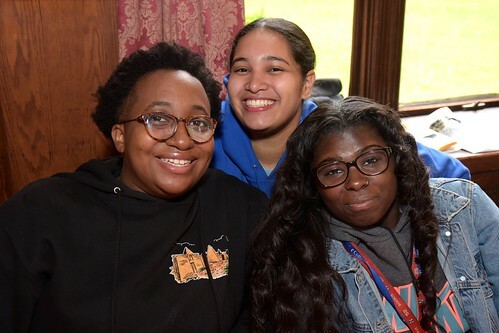 “Family Weekend is a wonderful tradition at CNR that celebrates our students’ academic achievement in the School of Arts & Sciences and School of Nursing & Healthcare Professions and provides an opportunity for students to enjoy time with their loved ones on our beautiful campus,” said Dean of Students Tiffani Blake. As always, a highlight of the weekend was Honors Convocation, held on Saturday in Holy Family Chapel, at which the School of Arts & Sciences and School of Nursing & Healthcare Professions acknowledged exemplary students. Recent alumna Michelle Goyke SAS’16 returned to campus to deliver an inspirational keynote address. “CNR’s tagline is Wisdom for Life and that is exactly what w e all get from CNR… a stellar education and passion for learning that follows us way beyond graduation. For some of us here today, including myself as a first-generation college student, CNR’s commitment to fulfill its mission of providing an education to those who may have not otherwise been able to obtain it is what makes CNR stand out beyond all of the other colleges. “Inside and outside of the classroom, whether you notice it or not, CNR is training you to become strong and confident leaders. CNR’s small class sizes allow for your professors, (who are quite phenomenal if I may add) get to know each of you individually. Most of them being well-versed and experienced in their industry, they can help open your eyes to different career paths and also provide you with great advice. I found my professors to be so supportive, and my biggest advocates … they opened up so many doors for me and for that, I am the upmost grateful. Following the Convocation, students and their families enjoyed the Fall Fest and Family Weekend BBQ. There were even more dining experiences to be had Saturday evening as families explored downtown New Rochelle’s vibrant culinary scene. Throughout the weekend, students and families cheered on the Blue Angels women’s and men’s teams as they took on King’s College and the Culinary Institute of America on the volleyball court and soccer field. The weekend closed with Mass in Holy Family Chapel, after which friends and family left campus with many happy memories, new friends, and an appreciation for the warm and welcoming community that is The College of New Rochelle.